Young farmers from all over Northern Ireland will be coming together next Saturday (9th December) for the President’s Christmas Appeal in a bid to brighten lives this festive season. YFCU clubs will be joining together to hold a series of county events where they will be donating children’s toys and food items to their chosen charities in a province wide handover. The aim of the campaign is to bring the community together and help those in need. Last year the appeal was a great success and connected YFCU members to their local community, helping spread the festive spirit. Young farmers’ clubs in Co Londonderry will be collecting toys and gifts for their chosen charity, Women’s Aid and will travel to their Causeway offices on Saturday, December 9th to hand over the gifts that their members have donated. Co Armagh will be holding a coffee morning in Collone Young Farmers Hall from 10am – 12pm on Saturday 9th December, where YFCU members will be donating toys and gifts to their chosen charity, Daisy Lodge with any money raised from the coffee morning also going to the charity. Co Down young farmers’ will be attending Saintfield Market on Saturday, 9th December from 9am – 3pm where they will be donating food items and manning a stand for people to also donate to the Newtownards Food Bank. Co Fermanagh young farmers’ will be donating children’s toys and gifts on Saturday, December 9th to their chosen charity, Positive Futures which supports children and adults with a learning disability, acquired brain injury or an autistic spectrum condition and their families. 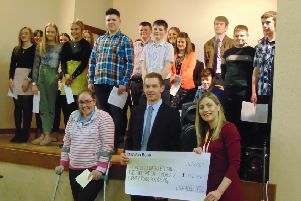 Co Antrim young farmers’ charity of choice is Cash for Kids where they will be handing over gifts and toys to the charity at Kells and Connor YFC’s Annual Christmas Fair and Coffee Morning that will be held on Saturday, 9th December in Kells Presbyterian Church Hall from 9am to 1pm. Finally, CoTyrone young farmers’ will be collecting toys and gifts for their chosen charity, Horizon West Children’s Hospice with members handing over donated gifts to the charity also on Saturday 9th December. YFCU president James Speers commented: “The generosity of our members is absolutely amazing and I am extremely proud of all the clubs coming together to help donate gifts and food items for those in need this Christmas.